They are the troops that nobody wants to see, carrying a message that no military family ever wants to hear. Making documentaries has put me in the room with people sharing some dark moments. The impact of that is hard to sum up but it must be just a small part of the challenges some journalists face in day to day reporting – being there when they come knocking or having to do the knocking yourself. Gauging a *respectful distance, *knowing when to ask the question or point the camera/microphone in the face of someone grieving or dealing with something life changing, and when not is a real skill, hard won and one that gets my deepest respect. Rocky Mountain News reporter Jim Sheeler and photographer Todd Heisler spent a year with the Marines stationed at Aurora’s Buckley Air Force Base who have found themselves called upon to notify families of the deaths of their sons in Iraq. It (rightly) won them a Pulitzer prize. What drew me to the piece was not just the effort that went in to making the online version as rich and as deep as the print version. It was the first time I had seen an audio slideshow really used to it’s best effect. 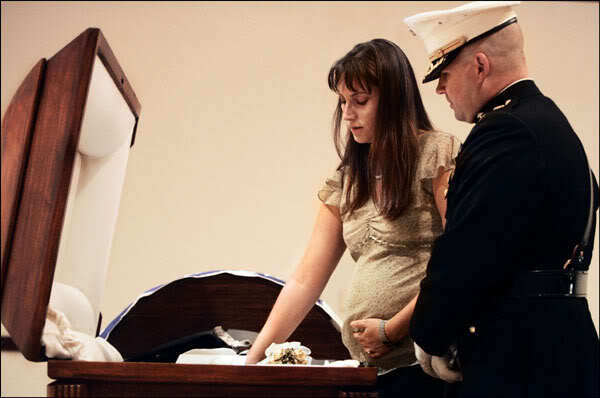 One slideshow follows Katherine Cathey as she met the body of her husband, killed on duty. Heavily pregnant she spends the night sleeping next the coffin. The access is intimate – in the slideshow we hear her voice – the coverage immensely emotional. It got to the point that I had to leave the room when I showed it to a class. I wish I could show it to you. But I can’t. In 2008 the paper closed. The website is still there, a bit of a memorial now. The Final Salute page is still there too but the files (save a few places that have some of the print pdfs) are gone. In among all the things that we might regret about the way the industry is dealing with everything it has to face especially the loss of jobs, perhaps it’s a bit churlish to regret the loss of a bit of content – is 6 years a* respectful distance*? But I’ve yet to see such a coherent and emotional piece of reporting that makes such great use of multimedia. Yes, multimedia packaging like Snowfall is stunning and, in their way no less emotional and journalistic and of course there is plenty of powerful journalism going on. But this was 2006. This was benchmark, defining multimedia journalism. It’s a shame it’s gone.